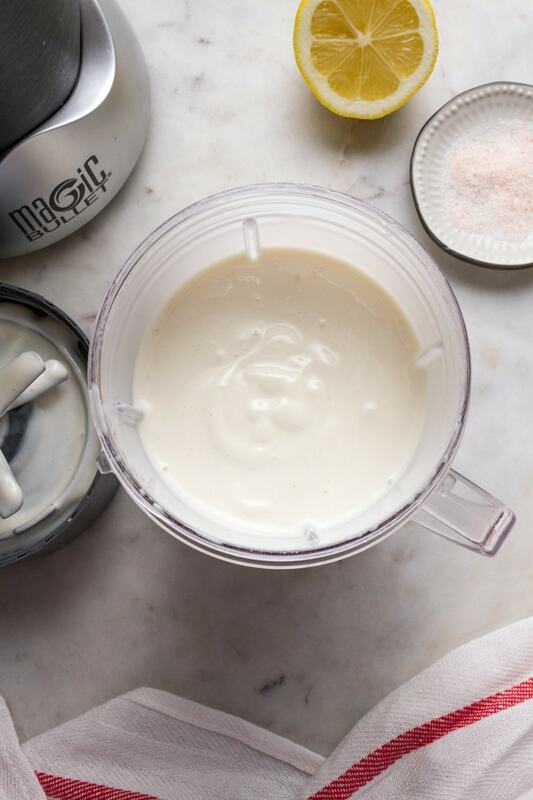 Once you’ve had vegan mayo made from scratch, you’ll never want to buy store bought again. 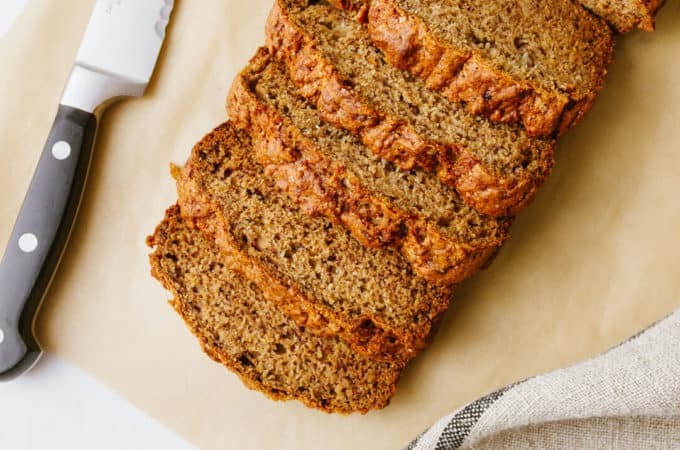 It’s clean tasting, healthy, and SO easy to make! 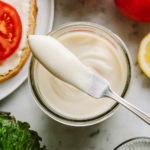 This vegan mayo recipe made with only 6 ingredients – tofu, oil, lemon, vinegar, dijon & salt – and ready in 2 minutes, is seriously the best mayo I’ve ever had, vegan or not! 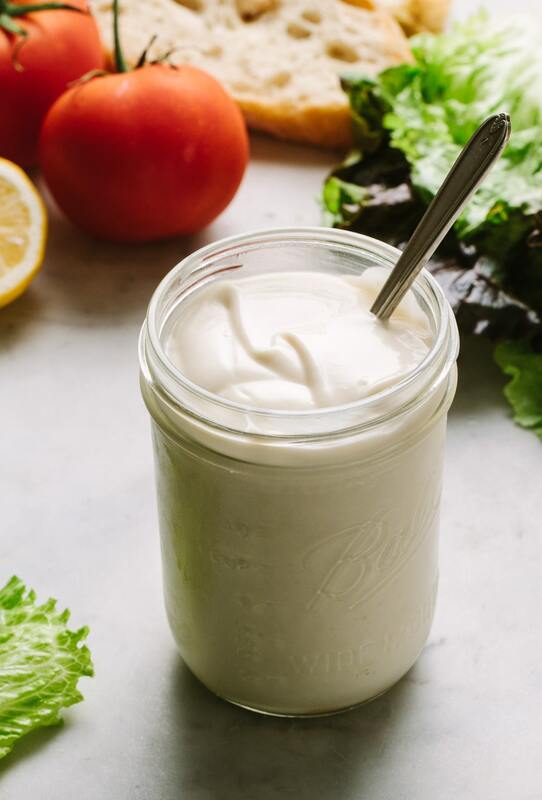 Homemade vegan mayonnaise tastes luscious, fresh and is so much healthier than store bought. I’ve never really cared for store bought vegan mayo’s because of the oily aftertaste and the list of ingredients. 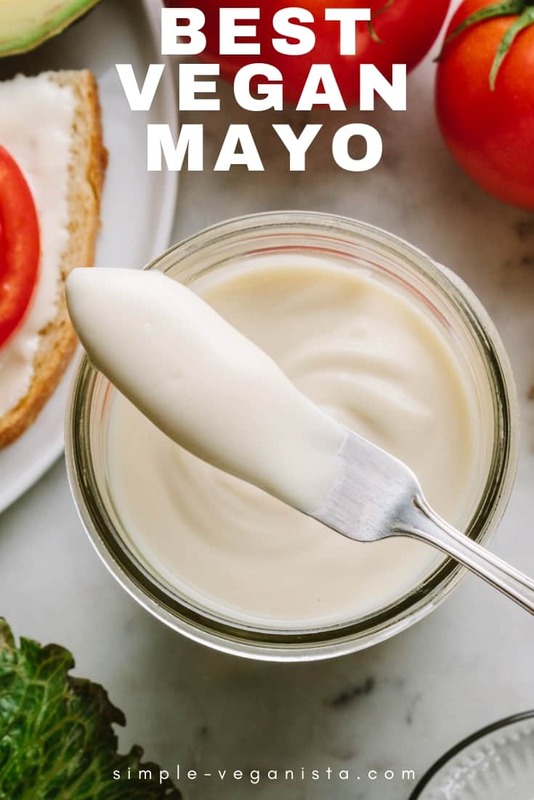 I’ve always opted to use a tahini based or hummus binder in my recipes, so I’m thrilled to have finally put together a vegan mayo recipe that can be made fresh in minutes and passes my pickiness for mayos. 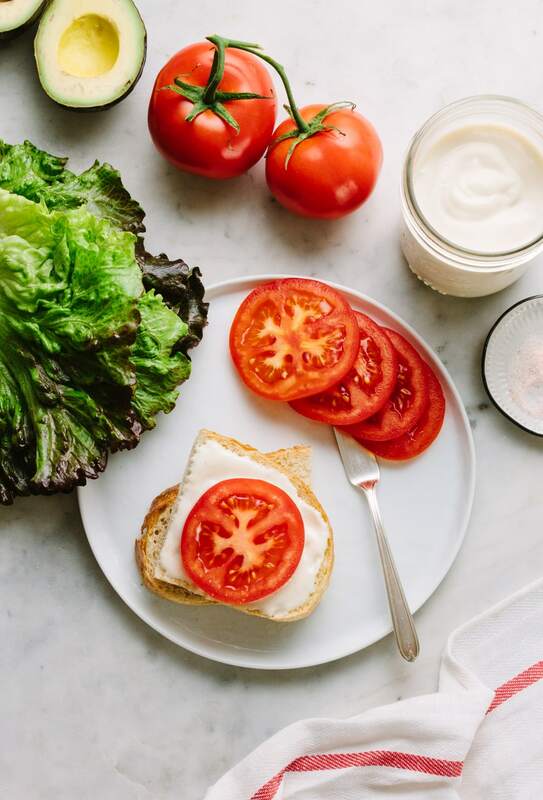 Over the last few days, I’ve thoroughly enjoyed slathering this vegan mayo on a slice of No Knead Bread with fresh tomatoes, leafy greens, avocado, salt & pepper. 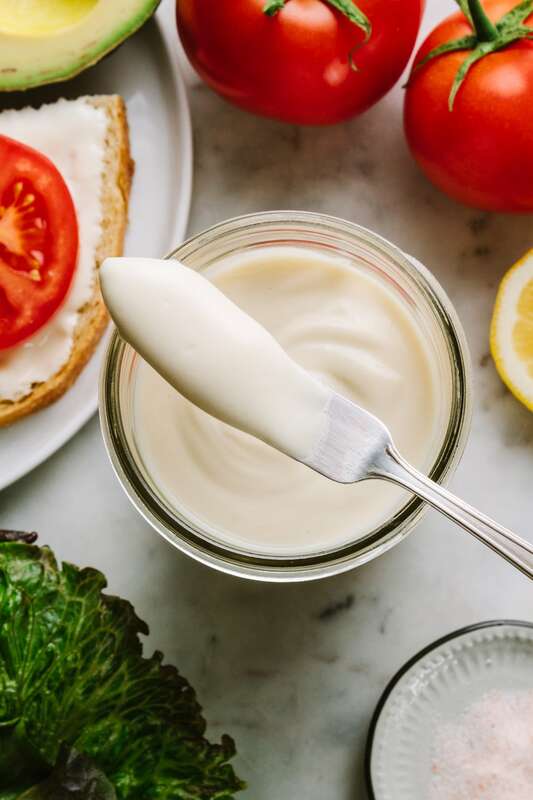 I can’t seem to get enough, and I know you’re going to LOVE this plant-based, eggless mayo too! 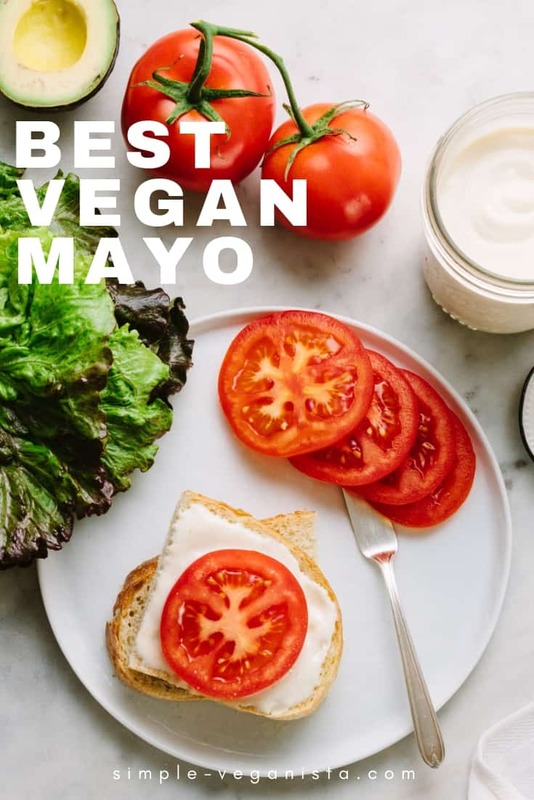 Use this vegan mayo as a binder in this Sonoma Chickpea Salad, Mashed Chickpea Salad, or Creamy Chickpea Potato Salad. It’s also great as a spread for this Favorite Summer Veggie Sandwich, Smoky, Chipotle TLT or Toasted Avocado-Tofu Sandwich. Or use it as a dip for these Baked Sweet Potato Wedges or Roasted Delicata Fries. It starts with the best ingredients! 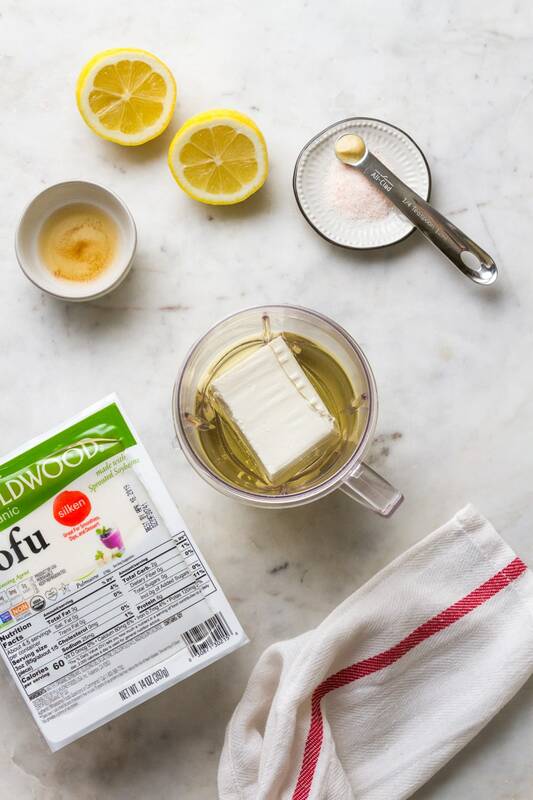 Tofu: Only use silken or soft tofu, as they both blend up ultra silky smooth and creamy. 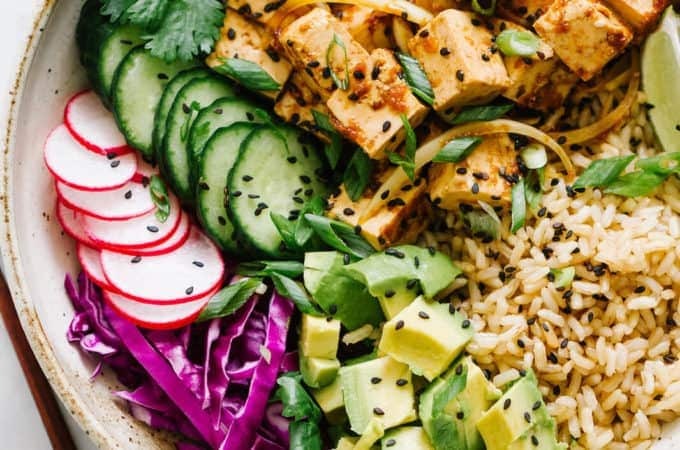 Tofu has no flavor, is low-fat and contains protein. It also binds well with the oil and doesn’t separate, making it ready to use anytime without additional stirring (although I do like to give a stir anyway before using). Seek out organic tofu whenever possible. Oil: For best results, the trick is to use neutral flavored oils such as – organic canola, safflower or extra-light flavored olive oil. These days, my favorite oil for just about everything is extra light tasting olive oil and it works great here! Regular olive oil, or even extra virgin, may have a stronger flavor, so keep that in mind. Acid: Just as store bought, we’ll be adding an acid in the way of vinegar and lemon juice. These are typically added to preserve freshness, among other reasons, and they taste good too! If you find you only have one acid on hand, you’ll be fine and still have a fantastic mayo, just add a smidge more of what you do have. Spice: For an added layer of flavor, a little Dijon mustard will do the trick (it also aids in emulsifying as it contains small amounts of lecithin). And a good dose of mineral salt will round out the flavors perfectly. Tip: If you don’t care for Dijon, try onion powder – it’ll be just as tasty (and you’ll still have perfectly creamy mayo). Small Personal Blender: Simply add everything to the cup, attach the criss-cross blade and blend for 30 seconds to 1 minute. And voila! 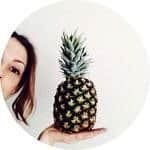 This is my preferred method and love my NutriBullet (<< affiliate link) for small jobs like this! Immersion Blender: Place the mayo ingredients into a 2-cup measuring cup, blender cup or tall straight glass (a mason jar would be great), place the immersion blender in and blend until creamy, about 30 seconds to 1 minute. This method was easy too, and made great mayo. I have and use this handheld stick blender (<< affiliate link), it’s great for pureeing soups too! Regular Blender: Simply place the ingredients in the blender, and process until smooth and creamy, about 30 seconds – 1 minute, stopping to scrape down the sides as needed. Depending on the size of your blender, this may work best when doubling the recipe. Once mayo is blended, always taste for flavor. It shouldn’t be bland at all, but taste buds vary. Add a little more salt as needed. It will be ready to use right away, and will thicken more once refrigerated. 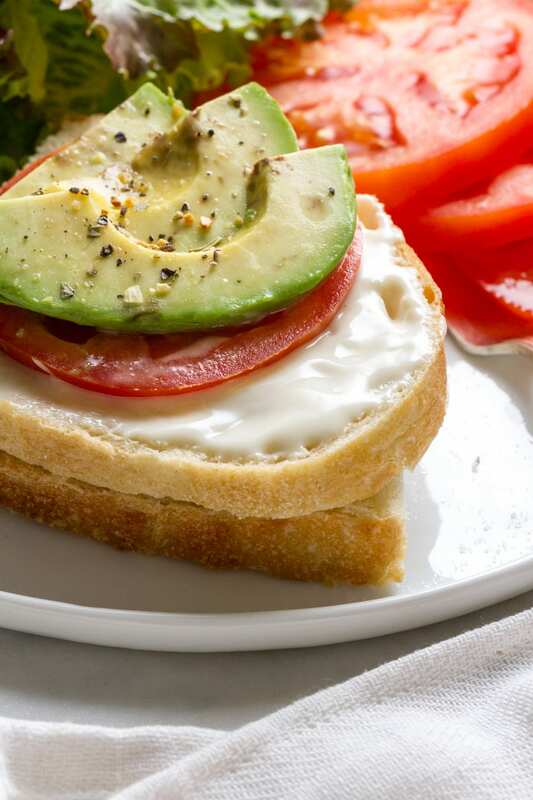 Store your vegan mayo in an airtight container, for up to 1 week, in the refrigerator. Great anywhere mayo is called for! Looking for more vegan condiments, try this Vegan Aioli (2 Minute + Oil Free) , Tahini Miso Dressing-Dip, or Vegan Cashew Sour Cream. See all vegan Condiment recipes on TSV! 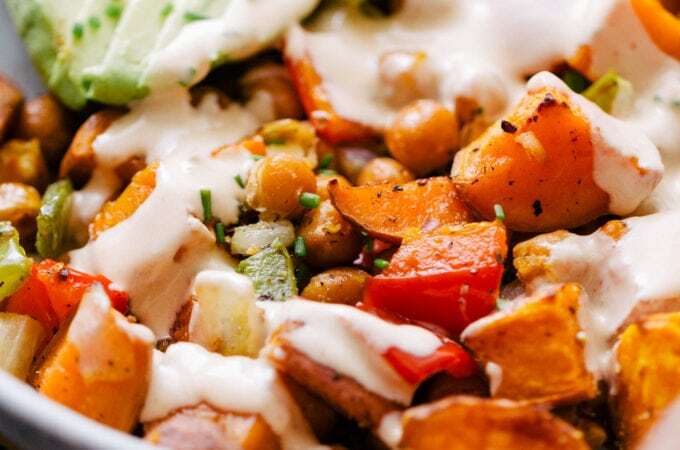 If you try this easy vegan mayo, please let us know! Leave a comment and rate it below. I love to hear what you think, or any changes you made. Thick, luscious and so easy to make, you’ll never want to bother with store bought mayo again! Small Personal Blender: Simply add everything to the cup, attach the criss-cross blade, and blend for 1 minute. Taste for flavor. This is my preferred method and love my NutriBullet (< affiliate link ) for small jobs like this! Immersion Blender: Place the ingredients into a 2-cup measuring cup or tall straight glass (a mason jar would be great), and using the immersion blender, blend for 30 seconds to 1 minute, until creamy. Taste for flavor. Regular Blender: This will work best when doubling this recipe. Simply place the ingredients in the blender, and process until smooth and creamy, about 1 minute, stopping to scrape down the sides as needed. Taste for flavor. Store in an airtight container in the refrigerator for up 1 week. If you don’t care for dijon, try adding 1/4 teaspoon onion powder. If you don’t have both lemon and vinegar on hand, taste for flavor with the one ingredient you do have, adding a little more as needed, a teaspoon at a time. To limit the oil, use 1/4 cup. Alternately, add more if you prefer, up to 1/2 cup.